Top : Designers : Design Articles : What's the Ideal Sailing Rig? The type of rig is often a pre-ordained choice once one has determined vessel size, the preferred layout, and the maximum size of sail one can handle. Is there a reason to prefer one rig type over another? How does one choose an appropriate aspect ratio? Michael Kasten. 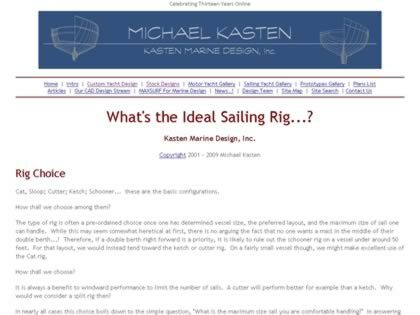 Web Site Snapshot: If available, above is a snapshot of the What's the Ideal Sailing Rig? web site at http://www.kastenmarine.com/gaff_rig.htm as it appeared when this site was added to the directory or last verified. Please Note that Boat Design Net has no involvement with the above web site; all content and images depicted in the above thumbnail are the property and copyright of What's the Ideal Sailing Rig? unless otherwise noted on that site. Description: The type of rig is often a pre-ordained choice once one has determined vessel size, the preferred layout, and the maximum size of sail one can handle. Is there a reason to prefer one rig type over another? How does one choose an appropriate aspect ratio? Michael Kasten. Visit What's the Ideal Sailing Rig?